Office workers who walk away from their desk to make a cuppa or have a chat with a colleague – even those who sneak out for the occasional ciggy are not robbing their employer of wages. 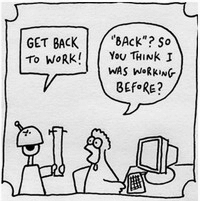 The idea that presenteeism should be used a baseline for productivity is not just crazy, it is pernicious. Peddlers of such nonsense need to be put straight immediately to stop them causing any more damage to their companies. Most employers accept this and don’t seek to curtail it. They realise that short regular breaks are good for maintaining focus and mental agility. Unlike the occasional piece of ludicrous ‘research’ there is simply nothing to be gained by adding up the time taken by employees to clear their heads and regain focus. However, remove the tea from the equation and all of a sudden, things look somewhat different. Tea breaks pale into insignificance when compared to eBreaks. One survey last year suggests that nearly 2 million British workers spend over an hour every day on social media websites. More than half of the UK’s working population now accesses social media whilst at work, with a third of those (roughly six million) are spending more than 30 minutes on the likes of Facebook and Twitter. Is this any worse than the good old fashioned tea break? Clearly many employers think so. According the Mark Ragan, 57% of US companies block employee access to social media sites like Facebook, Twitter and YouTube. But I bet they don’t have such issues with the humble tea break. Well I think they are making the wrong call – and so does the Great Place to Work Institute. The essence of a great place to work is trust. Thirty years of experience working with the most successful organisations in the world leads the Institute to conclude that the foundation of every great workplace is trust between employees and management. The organisational and financial benefits to any organisation of being a high trust environment are well documented. Companies that appear in the annual 100 Great Places to Work consistently outperform their peers. And according to Erin Lieberman Moran, senior VP at the Great Places to Work Institute, these companies are not blocking staff access to social media. “If you are hiring great talent then you need to trust them to make the right decisions. If you’re holding them accountable to their performance, when and how they get their work done should be less important than the actual results they are delivering to the organisation”. Brings us back to presenteeism. If you trust people and manage them well – and by that I mean keep them busy with challenging and meaningful work – their value should be measured by their results not by their presence. I take quite a few eBreaks during my working day. OK, so my working day may be extended by a few hours beyond those stipulated in my contract in order to ensure my work never suffers, but that is my choice and quite frankly, I would not have it any other way. I love my job, I love my profession and I love my company. Without my regular eBreaks, I suspect I’d find it difficult to maintain this level of intensity and I’m sure our relationship would suffer.